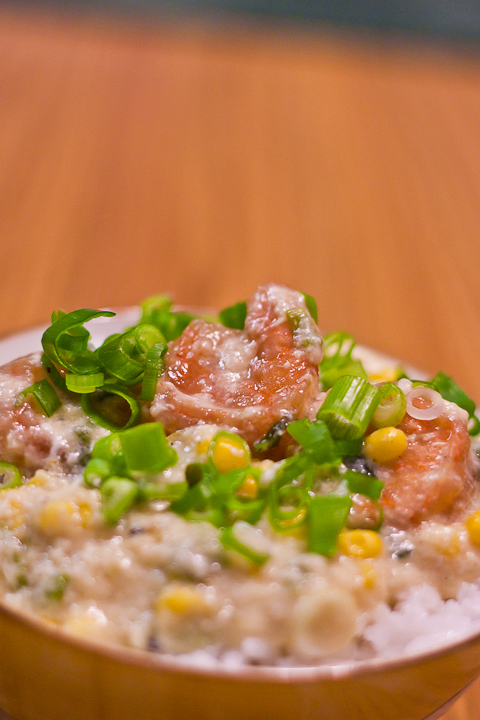 I don’t know the exact English name of this dish, but roughly translated it comes out to Shrimp with Egg Sauce. Along with Singapore Curry Rice Noodles, my family used to order this often after Chinese School. Today I want to share my version with you. I got the general recipe from my friend’s father who is a chef. Shoutout to him and his great cooking skills. I cooked this and steamed salmon tonight which will be in subsequent post. Note: we are only going to use half of the shrimp we are marinating. The rest can be used for another time. The night before: If you plan on using frozen shrimp, defrost, deshell, and devein until all shrimp are clean. Once cleaned, place onto a paper towel and dry shrimp completely. 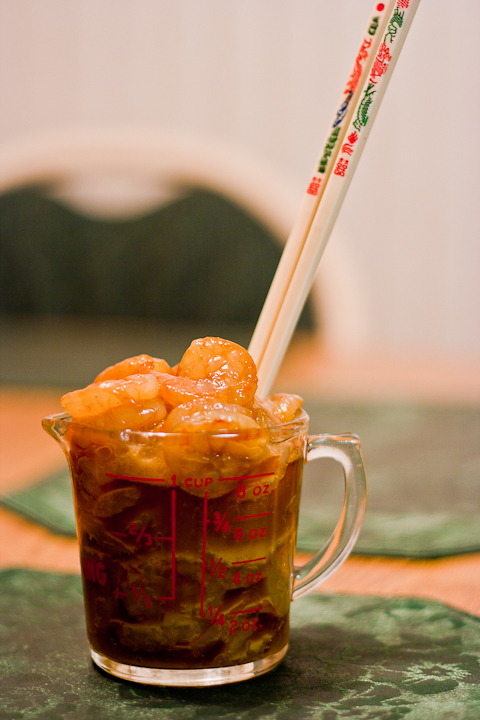 Pour dry shrimp into bowl and combine with remaining marinade ingredients (soy sauce, cooking wine, oil, etc). Stir well to combine making sure that cornstarch is dissolved through. Cover and place into fridge overnight. For this recipe, we will only be using half of the shrimp that we are marinating. Save the rest for stir-fry or whatever you want. Take out half of the shrimp (about 16) and place in a bowl. Let the shrimp come to room temperature – about 30 minutes. Bring a small pot of water to a boil. Place shrimp in the boiling water for about 30 SECONDS or until the shrimp change color and are slightly undercooked. Take out of boiling water and set aside. We want the shrimp to be a little undercooked because it will be finished in a later step. Wash and chop the scallions into small rings and set aside. Crack the eggs into a separate bowl. Mix until egg white and yolk are nearly homogeneous mixture. Set aside. Measure out a cup of frozen corn and place into microwave until defrosted. I think I cooked my corn about a minute and a half. If you set the time for too long, your corn will be chewy – gross. Heat up the wok. Once hot, add in the oil. 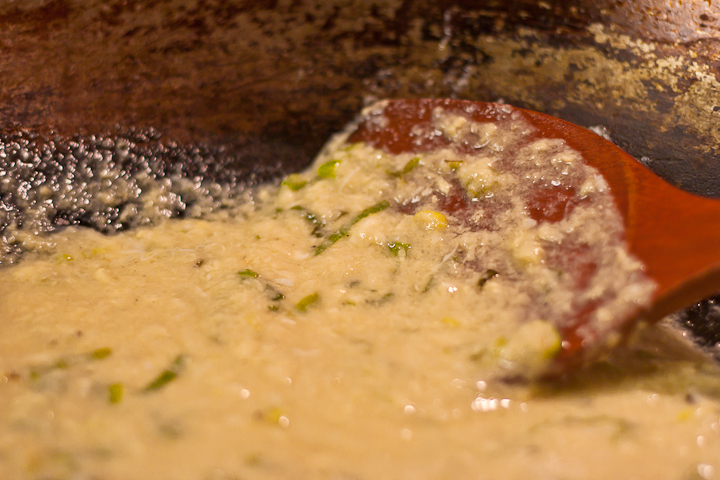 When the oil begins to smoke, add in 3/4 of scallions and begin to cook until fragrant. This shouldn’t take long – maybe about 30 seconds. When the scallions are fragrant, add in your liquid. I used homemade chicken stock but you can use water if you don’t have stock available. Bring the mixture to a boil. While you wait for the mixture to boil, dissolve the cornstarch (1/2Tbsp) into a bowl with some water. Make sure there are no clumps. Once boiled, check the liquid for taste. My stock wasn’t too salty so at this step I stirred in a bit of salt. During this tasting phase, the liquid temperature will drop. Don’t worry. Add the dissolved cornstarch and bring to a boil again. The reason we boil a second time is to make sure the corn starch is completely combined into the sauce. After the second boil, lower the heat to the minimum level or turn off the burner. It’s time to add in the eggs. Since this is NOT a scrambled egg, you DO NOT want clumps of egg but instead want the egg to be gently mixed through the sauce. Think of how eggs are in in egg drop soup – similar to that consistency. 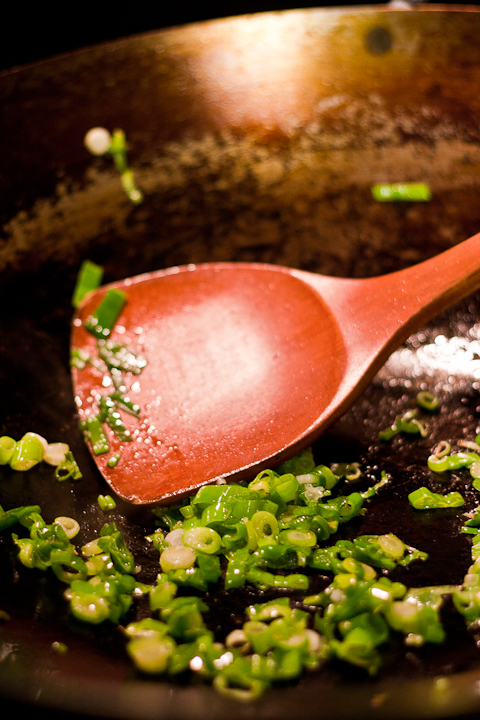 Turning off the heat helps to prevent the eggs from overcooking in the wok. Pour in a bit of the beaten egg at a time and constantly mix so no clumps form until both eggs are used. If done correctly, the sauce mixture should be slightly runny as shown below. If it is too thick, you either cooked your egg too long or need to add some more liquid to compensate for the evaporation in previous steps. It’s possible that you added a bit too much cornstarch. Whatever the case is, add a bit more liquid to compensate. From this point on, you can turn the heat back on and keep the wok at low. Constantly stir the mixture so that no clumps form. Make sure the egg is cooked through but not clumpy. About 5 minutes before serving, add back in the shrimp and corn. Combine well and reheat until everything warm. Use the remaining scallions as as garnish when serving. Enjoy.